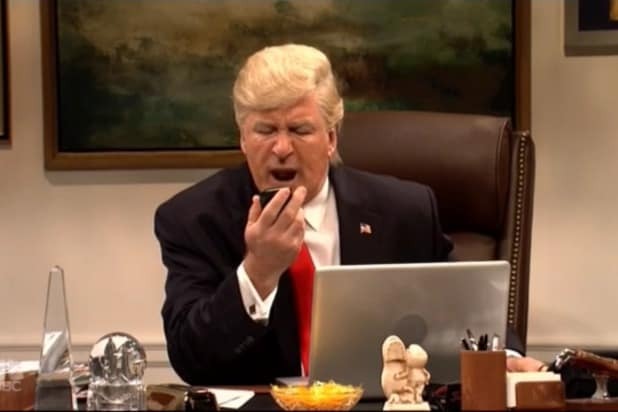 In keeping with the rest of this season of “Saturday Night Live,” this week’s episode opened with Alec Baldwin as Donald Trump, this time going in on Trump’s very real propensity to retweet bad Twitter accounts. With Kate McKinnon as KellyAnne Conway (another delightful “SNL” staple this year) by his side, we see Trump distracted from his presidential duties as he enthusiastically retweets a high schooler named Seth, along with other real Twitter accounts, during an important meeting. You can watch the full sketch above. “Seth, I thought I told you to turn off your phone,” said Seth’s teacher. “I’m sorry, Mrs. Leman, I think someone retweeted me,” replied Seth. President-elect Donald Trump would, both on “SNL” and reality. The skit cycled through a few different situations involving really terrible Twitter users discovering that they’d been retweeted by the President-elect. “It’s just a plate of mashed potatoes,” replied Conway. Steve Bannon, who was represented as Death itself (black cloak and all), entered the skit last to close it out.